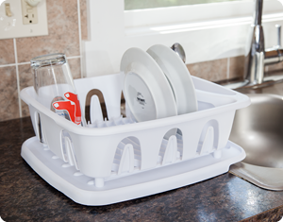 The Small 2 Piece Sink Set is made for use in the kitchen sink area and is ideal for drying flatware, plates, bowls, and cups. 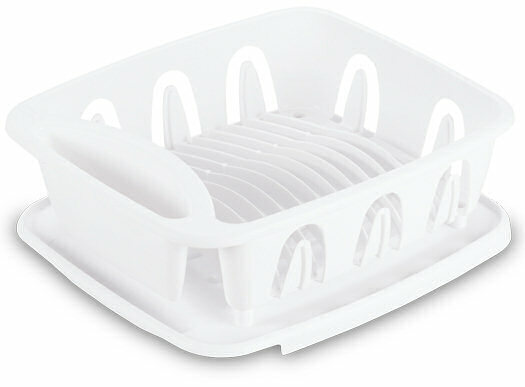 It includes a dish drainer and drainboard that are attached, yet detach easily for cleaning. 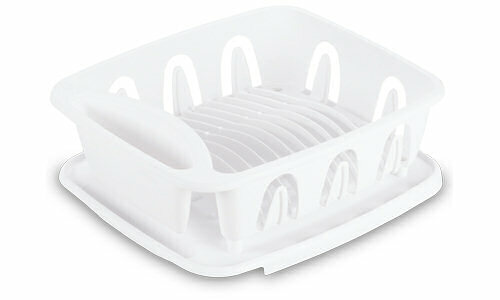 The dish drainer offers an oversized flatware holder and can comfortably accommodate 12 large plates and 8 cups. The inclined drainboard allows excess water to flow easily into the sink. The unique system of channeled grooves, hold dishes in place neatly and the perimeter cup holders around the sides hold a maximum of 8 cups. The overall dimensions of this item are 14 1/2" L x 12 5/8" W x 5 1/4" H.
Overall Assembled Size: 14 1/2" x 12 5/8" x 5 1/4"
Ideal for drying flatware, 12 large plates and 8 cups. 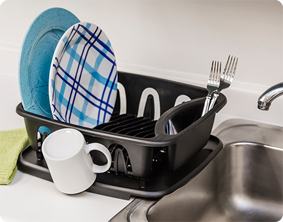 Inclined drainboard allows excess water to flow into the sink. Small 2 Piece Sink Set is rated 4.5 out of 5 by 2.